I live in Silicon Valley, which operates on the assumption that there's no problem that technology can't solve. It suffuses our culture here, and sometimes we pay the price for this technocratic utopianism. Case in point: Right now, I'm sending my kid to a public school in Mountain View, CA--the home of Google--where the administrators have upended the entire sixth grade math program. Last August, they abolished the traditional math program--you know, where students get to sit in a classroom and learn from a trained and qualified math teacher. And instead the administrators asked students to learn math mainly from a computer program called Teach to One. Run by a venture called New Classrooms, Teach to One promises to let each student engage in "personalized learning," where a computer program gauges each student's knowledge of math, then continually customizes the math education that students receive. It all sounds like a great concept. Bill Gates has supposedly called it the "Future of Math Education." But the rub is this: Teach to One doesn't seem ready for the present. And our kids are paying the price. If you read the article, here's what you will learn. The Mountain View school district apparently budgeted $521,000 to implement and operate this new-fangled math program in two local schools (Graham and Crittenden Middle Schools). Had they adequately beta tested the program beforehand, the school district might have discovered that Teach to One teaches math--we have observed--in a disjointed, non-linear and often erratic fashion that leaves many students baffled and disenchanted with math. The program contains errors in the math it teaches. Parents end up having to teach kids math at home and make up for the program's deficiencies. And all the while, the math teachers get essentially relegated to "managing the [Teach to One] program rather than to providing direct instruction" themselves. By October, many parents started to register individual complaints with the school district. By December, 180 parents signed a letter meticulously outlining the many problems they found with the Teach to One program. (You can read that letter here.) When the school later conducted a survey on Teach to One (review it here), 61% of the parents "said they do not believe the program matches the needs of their children," and test scores show that this crop of sixth graders has mastered math concepts less well than last year's. (Note: there was a big decrease in the number of kids who say they love math, and conversely a 413% increase in the number of kids who say they hate math.) Given the mediocre evaluation, the parents have asked for one simple thing--the option to let their kids learn math in a traditional setting for the remainder of the year, until it can be demonstrated that Teach to One can deliver better results. (Teach to One would ideally continue as a smaller pilot, where the kinks would get worked out.) So far the school district, headed by Ayindé Rudolph, has continued to champion the Teach to One program in finely-spun bureaucratic letters that effectively disregard parental concerns and actual data points. But the schools have now agreed to let students spend 5o% of their time learning math with Teach to One, and the other 50% learning math from a qualified teacher. Why the impractical half measure? I can only speculate. I posted this so that interested parents and educators, wherever you live, can be prudent and thoughtful when it comes to adopting computer-driven math programs. Perhaps you can learn something from our cautionary tale. Do your research, run a controlled pilot, and make sure the product is actually a good fit for your school. Again, I would encourage you to read the fine article in The Mountain View Voice, the parents' letter outlining the observed deficiencies in the Teach to One program, and the eye-opening survey results on Teach to One. Update: It was announced on January 12 that the Mountain View will discontinue the Teach to One math pilot effective immediately. Patronizingly, New Classrooms has attributed the scrapping of the pilot to a communication problem. “There was a subset of parents of higher-achieving students who didn’t fully understand how Teach to One operated and how much it benefited their children,” Joel Rose is quoted as saying in The Wall Street Journal. Once again, I'd refer you back to the actual data collected by our schools. It speaks for itself. Great Articles by The Mountain View Voice: Mountain View's local paper has done some excellent reporting on this fiasco. I would encourage you to read them all. This story has also received coverage from The Wall Street Journal and Edsurge. Update 2019: It sounds like another Teach-to-One pilot in Elizabeth, NJ has its own issues. Read here and here. As a technologist who has developed a program that uses a patented Socratic tutor to teach math from pre-algebra through pre-calculus I know the pitfalls. We tested on over 4000 students before we released it. We also don’t claim to stand alone. We are a tool. We are also free. You may want to tell your math teachers to look at useusinclass.com so they can add our free product to their toolbox. Wonderful solution. Jist replace one cr@ppy piece of software with another, identically cr@ppy. 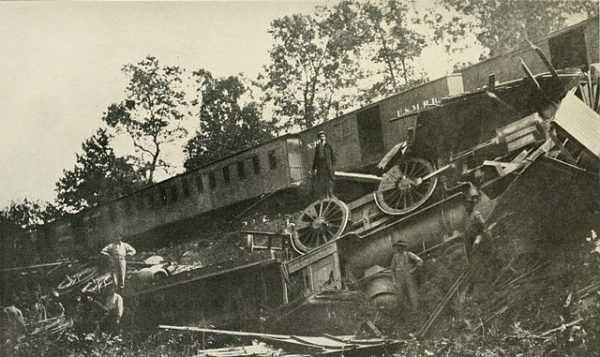 I checked the source of the train wreck image on Wikimedia Commons and it says ‘author unknown’. So I’m wondering how you came to post an attribution to Marie Maye. I’m assuming you are using an attribution script of some sort….? Years ago while living in El Paso, Texas we were switched to “new math” in the sixth grade. I could pass tests but never understood it. Years later, in the days before calculators and computers, my job involved a lot of hand calculated math. This finally got me comfortable with math — again. Then, while he was in grade school, my brother who is eight years younger was taught every class with half of the class in English and half in Spanish. Some “brilliant” academic decided that the kids would pay attention and learn the other language. Terry said he did homework for other classes, read comic books, and generally ignored the Spanish part of the classes. “In theory there is not difference between theory and practice. In practice there is.” ~~ Yogi Berra So, why don’t these academics who come up with these “great theories” test them before inflicting them on our kids? They might learn the truth in Yogi Berra’s quote. their software cost the school district $500K and attempts to replace the educator in the classroom. useusinclass.com is free and is a tool to allow the educator to introduce concepts with a Socratic tutor before they go over them in class, because it’s easier to teach a student who has been introduced to the concepts with hands-on operations than it is to teach them something they have never seen before. The $500K software solution attempted to run the class with the educator being a tool for the software, the *free* useusinclass.com solution is a tool for the educator who is running their class. My guess is that before you typed your insightful commentary you didn’t even bother to go look at the product at useusinclass.com. It’s open minds like yours that are the future of a brilliant education system. (sorry, but people who say A is bad because it’s software therefore B is bad because it’s software when A and B are clearly two very different tools make me a bit snarky). Interesting commentary. Is this a teacher by chance writing this article? I suspect a negative bias after hearing positive comments on this TTO program from another teacher. A good friend uses Teach to One in her Oakland public schools math classes and she says its fantastic. She has kids from 4th to 10th grade leveling the same class….. and the old school teaching just doesn’t work. The smart kids get dragged down to the lowest common denominator. The slow learners just can’t keep up and get disenfranchised. This TTO program adjusts lesson plan to their level…..and then when they test out they move on- genius. It does separate the smart kids from the poor learners….as the smart kids learn faster and advance quickly with the below avg learners struggling. It would be easy to adjust the program/curricula if it were “Disjointed”. There is no doubt that software based learning is the future…..makes sense….software is tailor made for learning.